Historic Moments: Drum Majors battle in Europe! Drum Majors battle in Europe! It is understood that most of the strongest competition for chess lies inside of the European continent. It is here that players from around the world may travel to seek better conditions and compete for more lucrative prizes. The environment for chess is much more respectable and there is an infrastructure that supports chess activity. There are even a few news channels specifically dedicated for chess coverage. Three players traveled to Málaga, Spain to compete in the Málaga Open. For GM Pontus Carlsson, GM-elect Amon Simutowe and IM Emory Tate, it would be the first time the three have competed in the same tournament. It would also be the first such combination of Black players with FIDE titles. Both Carlsson and Simutowe are the same age and both have reached the Grandmaster level. Carlsson was conferred last year while Simutowe completed his norms and only has to complete his rating requirement. Tate is seeking the first of three norms. Carlsson receiving his 2nd place award at the Málaga Open. Tate communicated with The Chess Drum and excitedly mentioned the prospect of playing with Carlsson. "This will be the first tournament we play together, unless he visited a World Open before his title. Be that as it may. Time to beat the drum. Send a message, a warning, even. Rumors of my demise have been greatly exaggerated." Simutowe then spoke of his arrival at the tournament and would later spend time with Tate. Why is this event significant? Given there are so few active players of African descent competing, it is sometimes necessary to have players around with whom you share a common struggle. Each of the three players are at different stages of their playing careers and different stages of their lives. Both Carlsson and Simutowe are the same age and have had international exposure in chess. Tate's career has been situated in the U.S. with a few forays into Europe. It appeared as if there was some intrigue with three players coming from totally different backgrounds and totally different places. IM Emory Tate giving greetings at 2008 Málaga Open. 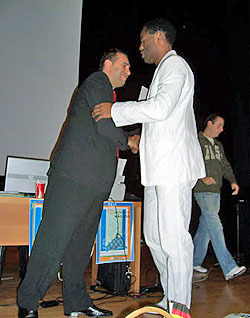 GM-elect Amon Simutowe giving greetings at 2008 Málaga Open.